Mirka Gold is the Production Grade of abrasive, for economical wood shaping and surfacing work. 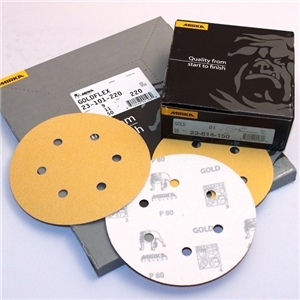 Mirka Gold 5" x 5 Hole Hook & Loop Sanding Discs. Range 60 to 320 Grit. Mirka Gold 5" x 8 Hole Hook & Loop Sanding Discs. Range 60 to 320 Grit. Mirka Gold 6" x 6 Hole Hook & Loop Sanding Discs. Range 60 to 320 Grit. Mirka Gold 9x11" Sheet. Range 80 to 400 Grit.